Once the film material has been specified and the Heatseal configuration is determined, one can move on to Heatseal Band Selection. Selection of the best Heatseal Band for any given application involves several considerations. The band must be of the correct width and configuration to produce the desired seal or cut/seal. In addition, the band must be thick enough (have sufficient mass) to store the heat energy required for delivery to the material being sealed. When creating an impulse seal, it is desirable to terminate the heating cycle as soon as possible and begin cooling. Remember, the seal is not finally made until the seal area is cool enough to be dimensionally stable. If the Heatseal Band is too thick or the heat energy delivered is too great, the cooling time will be prolonged, thus prolonging the total cycle and limiting production rate. Ideal Heatseal Band selection is a function of many variables including material composition, material thickness, heat absorption of the jaw, and the nature of the cover strip used over the Heatseal Band. In general, the thicker the material to be sealed, the thicker the Heatseal Band that should be used. Most materials, 1 mil to 6 mil can be sealed efficiently with Heatseal Bands in the thickness range of 0.1 mm to 0.25 mm. With very thick seals (multi-layers to totals of 15 mils or more) it may be well to use thicker bands or consider the possibility of applying heat from both sides. Sealing through unequal thicknesses as in the case of closing a gusseted pouch can be accomplished even when the material is thick. Two layers of 6 mil material equals 12 mils, whereas four layers would be 24 mils. This is a very significant difference. Seals of this kind can be made with heat from only one side providing that the sealing temperature range of the film is not exceeded and sufficient time is allowed for the heat to penetrate through the multi-layers to effect a bond. The two layer portion of the seal will not be damaged or burned through as long as the Heatseal Band temperature does not exceed the optimum sealing temperature of the material. Sealing time can be reduced by applying heat simultaneously from both sides. When heated from both sides, cooling will be slower, but cooling can be accelerated by the use of water-cooled jaws or air blown on the seal area and/or the jaw. TOSS Alloy-20® Heatseal Bands come in a wide variety of shapes, each one designed for a specific purpose. The most common of these are Tapered-edge Band, Reflex Band, Beaded Band, T-Profile Band and Cutting Wire. In addition, there are other less common bands such as Double Seam Band and Custom Seal Cut (CSC) Band. Heatseal Bands come in various widths to produce seals of various widths, but, they come in various thicknesses as well. Effective sealing at optimum speeds can only be made with a band of the correct thickness and mass. 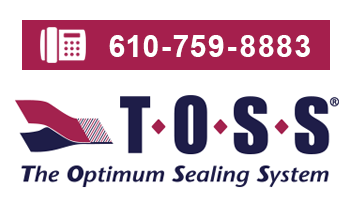 TOSS Alloy-20® Heatseal Bands are available in standard widths from 2 mm to 25 mm and thicknesses from .1 mm to .5 mm. A complete list of over 300 bands is available upon request. The common Flat Band is an old stand-by configuration that was originally developed to make seals with widths wider than that which could be made with round wire. In most applications, the Flat Band has been replaced by the Tapered-edge Band or the Reflex Band. The Flat Band has the major disadvantage of sharp square edges that cut into and weaken the film along the edge of the seal. Failures of this kind are called “zipper failures”; the seal itself is well secured and appears good, but the package is dangerously weakened. This band, usually called Tapered Band, is the contemporary version of the Flat Band. On this band the edges have been tapered down to a very thin edge. This produces two advantages. The tapering removes the sharp outer edge that cuts into the film while heating. It also acts to reduce the temperature of the band along its outer edges. Without a tapered edge the band will cut into the film along the edge of the seal and weaken the package. (See Flat Band). This very popular band is used for cutting the film layers and concurrently sealing along both sides of the cut line. It is made with tapered edges as well and comes in a wide variety of sizes. The space behind the bead does not come in contact with the underlayment backing material. As a result heat is not lost from the beaded area; the bead becomes hotter than the adjacent edges, thereby, effecting a cutting action without overheating the sealed edges of the film. This band, available in four (4) sizes, is made from solid extruded stock. It has a greater mass per unit of length than the Beaded Band and a sharper cutting edge. It is relieved in the back to minimize contact with its underlayment backing. This band retains its heat and is excellent for concurrently sealing and cutting multi-layers of film or thick film. This is an excellent band for thick materials, hard to seal materials, and vacuum packaging. Because of the convex configuration of the band, it only makes edge contact with the underlayment backing. This limited contact minimizes heat loss and provides more energy for the sealing of the film. The Reflex Band is also excellent for liquid sealing because the convex face acts to squeeze the liquid out of the seal zone as the seal is made. This special band is a combination of a Tapered Band and a Cutting Wire and is custom made to suit the specific needs of the application. The cut wire can be placed on the centerline of the band or along one edge, depending upon the desired result. Heatseal Bands can be constructed with segments along their length that remain cool while other segments reach sealing temperatures. These so called “Zebra” bands can have one or many hot and cool zones. They are used for making intermittent seals, sealing a multiplicity of small packages, or for making vent openings along a seal. They are all custom designed. The Double Seam Band is used to make two perfectly parallel narrow seals. Double seams, although rarely needed, produce the impression of greater integrity. They are useful in sealing liquids or other hard to seal materials.